Nonprofit cat rescue specializing in special needs, senior, and neonatal cats, though we try to help any cat who comes through the door. Second Chance Sheridan Cat Rescue (SCSCR) has a mission to rescue and rehabilitate special-needs cats, provide free and low-cost spay/neuter services to the local community, and assist people who need help keeping their pets during difficult life situations. Our rescue is no-kill, meaning we only euthanize animals that are in untreatable pain or suffering from disease. 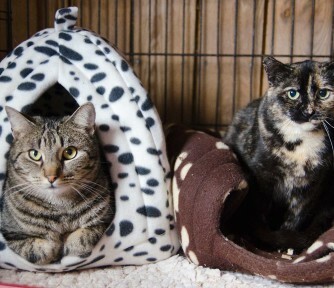 This also means that we must limit our admissions, and can only accept cats into the rescue when some of our current cats are adopted into loving homes. Vision Statement: The vision of SCSCR is that every cat in Sheridan County has a home, every dog and cat owner in Sheridan County has access to affordable spay and neuter services, and that every companion animal is treated with kindness and respect. SCSCR has three main service programs, each with their own clients: 1) The Adoption Program aims to rehabilitate and find homes for homeless cats. Clients may include former cat owners who need to surrender their cats for personal reasons, as well as new cat owners who are adopting a cat. 2) The Spay/neuter Program provides free or discounted spay/neuter services for cats and dogs owned by anyone in Sheridan County. Clients are typically low-income residents who cannot afford these services on their own. 3) The Sanctuary Program provides free cat boarding to people who need temporary housing for their pets. Typical clients include veterans at the local VA.
Have experience with Second Chance Sheridan Cat Rescue ?